Thank you for using LINEEYE products. LINEEYE has released the latest firmware (ver1.03) of LE-200PR/LE-150PR. Capture control function (ON/OFF of data registration by a trigger) is added. 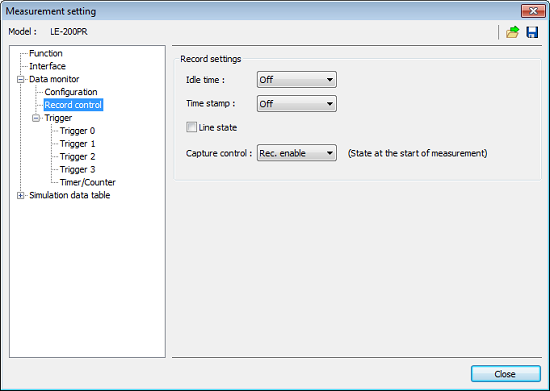 Capture control function is added with this version. By a trigger condition (error, character, control line, timer/counter, or idel time) it starts/stops data registration or changes its status. While recording stops the monitored data are not registered in the log data. Corrects the bug that when selecting data transmission as a trigger action on the setting the send table item turns to be blank. First, please version up the PC software and then connect the PC with the analyzer by USB cable and run the software. Then go to [Tool] -> [Check firmware]. A dialog appears prompting the update of firmware. Follow the instruction o the display to update the firmware to the latest version which is bandled to LE-LINK20R. When the firmware of the analyzer is the latest one the dialog does not appear. For the detail of how to update, please refer to the manual of the analyzer.